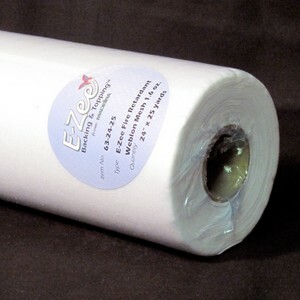 E-Zee Flame Resistant Weblon Mesh 1.6 oz. is made of polyester fibers with a melting point of 450°F to 460°F. This soft, mesh Cut Away stabilizer is great for infant and children's wear. Use when flame resistance is required for safety. To complete your flame resistant embroidery, use Madeira’s Fire Fighter embroidery thread and Fire Fighter embroidery bobbins. Cut a piece from a roll or use a piece of pre-cut E-Zee Flame Resistant Weblon Mesh to fit your hoop size. Hoop by placing the stabilizer underneath the garment. Embroider the design and remove the embroidered item from the hoop. Trim the excess stabilizer with a sharp pair of scissors or shears, leaving approximately ¼” around the out side of the design. Rounding the corners instead of leaving them square or pointed will avoid curling later on. To avoid nicking the fabric when trimming away the stabilizer, hold the stabilizer while trimming and let the garment drape. Be sure to hold it with the back side facing up so you can see both the edge of the design and the fabric while you are trimming.